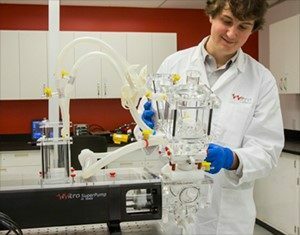 Whether for quick design iteration feedback or 3rd party independent testing for regulatory approval, ViVitro Laboratory Services offers fast turnaround times. Testing is conducted on all types of cardiovascular devices in accordance with applicable standards and regulations. ViVitro offers both pulsatile and steady flow testing which are ISO 17025 Accredited by A2LA. Depending on the device we can simulate different pathophysiologies including hypertension, hypotension, arrhythmias, to name a few. Using the ViVitro Labs steady flow bench, we test for steady forward flow or reverse flow leakage. Burst testing can also be conducted to measure the hydrostatic load at which failure occurs, this is a useful tool for determining failure modes of devices. Using the ViVitro Endovascular Simulator, we can create physiological pulsatile flow and pressures to test many types of cardiovascular devices and any portion of the cardiovascular system. Our vascular flow platform brings physiological pulsatility to anatomical models for research and development. The Endovascular Simulator addresses requirements of ISO 5840, ISO 25539, and ISO 7198 standards as they include simulated use guidelines. Our lab can control a live cardiac flow in a standalone configuration. We can test a variety of endovascular medical devices and delivery systems by adding anatomical models, including abnormalities or custom patient-specific models. Use the ViVitro Endovascular Simulator to demonstrate that devices can be delivered and deployed in a safe, consistent and accurate manner within the intended implant site and with intended use conditions. Our ex-vivo simulator is used to test transcatheter devices when realistic anatomy is required. The Lab team can perform mock animal studies using the Ex Vivo simulator to evaluate your device for functional performance. Obtain key indicators of valve performance including regurgitant fraction, effective orifice area, and numerous others. ViVitro’s standard test methods include testing at various beat rates, cardiac outputs, and back pressures. In addition to pass/fail information in accordance with ISO 5840, these methods can show design parameters such as minimized paravalvular leakage, transvalvular leakage, closing volume, leakage volume, and forward flow pressure drop. Along with quantitative data, ViVitro can provide qualitative high speed video and high resolution photography of a device while operating, providing key information on valve performance. The leakage rate through a device can be measured at constant back pressures. Testing can be conducted to determine paravalvular vs intravalvular leakage. A recommended study for transcatheter valves, steady forward flow testing is useful in verifying the accuracy of the pulsatile flow test as the pressure drop across a test valve is measured at various flow rates. Used for determining failure modes of devices, a Burst Test measures the hydrostatic load at which valve failure occurs.